When we began researching strapless bras for bigger busts, we were sure that today's blog post would be the definitive guide to the best DD+ strapless bras out there. But then we started trying them on. Some bras pushed everything (including armpit fat) up so high that we looked like an overflowing champagne glass. Others gaped on top. Still others left too much space at the base. It turns out there's a different standard for strapless bras than for everyday bras: Good Enough. Judy Masucci from Levana Bratique in Pittsburgh told us, "Sometimes with strapless bras you have to settle for 'as good as it gets'. They often do not tack at the sternum, they often gape at the top of the cup." At The Rack Shack in Brooklyn, owner Laura Henny says that the strapless bra that her H cup customers take on tropical vacations "doesn't fit as perfect as a regular bra, but it does the job.” Kim Berger of Lion's Lair Boutique agrees: "When it comes to a strapless, it's really about just being 'good enough'. It's rarely a technical fit and often not comfortable . . . kind of like stiletto heels--they may make the outfit, but we suffer for the look!" If you've fallen in love with a bare-shouldered look, here are the strapless bras that we recommend giving a try. According to Kim Berger, this is "by far the best strapless we've found." 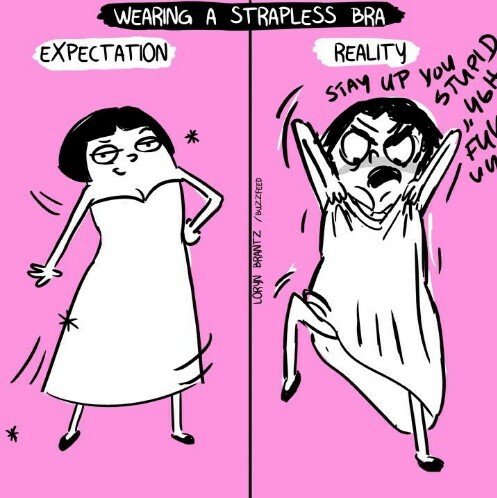 Man Repeller fashion editor Harling Ross decided that if she, an "average-boobed woman", had never found a comfortable strapless, then if a "big-boobed" woman "were to give a strapless bra a favorable review, that strapless bra would have to be amazing." The Wacoal Red Carpet is the "one strapless bra in particular that was mentioned over and over and over again" in response to her survey. The Koko is Laura Henny's go-to for deep plunges, and she says that it works especially well for women who wear D, DD and E cups. Laura wore this bra for her own wedding even though she had been determined not to wear a strapless gown because "I wanted to dance my a-- off." However, when the only dress she loved turned out to be a halter with ultra-deep cleavage, this bra "saved my life". Her seamstress put Velcro on the bra and her dress for extra security. Another great feature of this bra is the super wide trim on the top and bottom edges of the band for less digging into your skin. If you're bustier than an E cup, Laura recommends going up at least a cup from your usual size. Fortunately, there are many more options to try because different styles work better for different breast shapes. For instance, one blogger felt squashed in the Curvy Kate Luxe but swears by the Wonderbra Ultimate Strapless. A Levana client who had gaping and spilling in the Luxe found that the unlined Goddess Adelaide Strapless did a much better job of fitting her larger breasts and "wasn't nearly as bulky as some of the other styles". When shopping for a strapless bra, Levana Boutique's Judy says, "The best way to determine which style is going to work best for you is to try them on with the outfit you are going to wear them with. If there's a little bit of gaping at the top of the cup, it may not show with your outfit. So as long as it stays up, you can't always worry about getting the 'perfect' fit."